Create a warm atmosphere: Make buyers feel comfortable when they come in from the cold. Use warmer colors, like reds and oranges, to dress the interior. If you have a fireplace, light a fire to really make your home feel inviting. 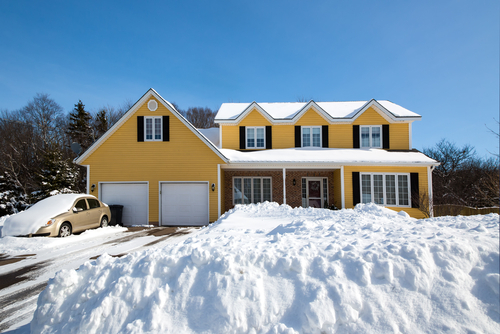 Don’t ignore the landscape: Just because your property is covered in snow doesn’t mean you should ignore its curb appeal. Add large urns or garden sculptures to the landscape. Add a bit of holiday cheer to the exterior by hanging up some lights (just don’t go overboard) or adding a green wreath to the entry door. Keep the entryway clean: It can be easy to dirty up the entryway during the winter, when snow and mud are more easily tracked in. Keep the entryway clean and uncluttered to prevent a poor first impression. Don’t forget about safety: The last thing you want is for buyers to slip and slide their way towards your home. Keep your pathways clear of snow and make sure you remove any safety issues by covering slick, icy spots with salt. Use professional photography: Convince buyers to come out in the cold to see your home in person by posting professional photos of your house. Use these tips to sell your home in the winter and be sure to contact us at Randy Lindsay today for additional home selling advice.